There is no denying that trampolining is a whole lot of fun, which is why so many children love it so much. However, it is not only children that can enjoy trampolining, and when you discover the health benefits associated with the activity, you may be more inclined to give it a go yourself. Get active and enjoy the benefits of trampolining. Jumping around on a trampoline is a form of aerobic exercise, and as such, your heart rate will speed up increasing the rate at which blood is pumped around your body. In addition to this, regular trampolining can strengthen the muscles needed to support your cardiovascular system. A small amount of stress caused by exercise is actually good for your bones. The repetitive action of jumping contributes to bone stress that encourages the build-up of mineral content. As an aging adult you could be at risk of developing osteoporosis, but this type of exercise, combined with the appropriate diet, can help to prevent this. Who would have thought losing weight could be so much fun? Jumping around burns calories which leads to weight loss, so if you need to drop a few pounds, or even a few stone, trampolining can help you achieve your goal. When you have your very own trampoline in your garden, you will be more inclined to use it, than traipse to the gym each day. It is advisable to invest in the sturdiest, most reliable trampoline you can afford if you plan to use it daily, and if your children will also be using it. 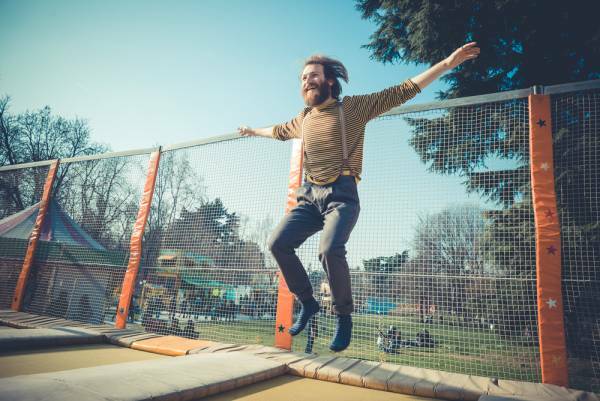 One of the most recommended models available right now is the Skybound Trampoline which boasts W shaped legs for stability, high safety nets, and a 330lb weight limit. The lymphatic system is one of the system is responsible for removing toxic substances and waste from your body. Jumping on a trampoline helps the lymphatic system do its job by using gravity and movement to stimulate the process. Many forms of exercise can prove too jarring for those with joint problems, but trampolining is not one of them. Gentle jumping has minimal impact on joints as the trampoline absorbs the impact of movement, unlike a hard surface that has no give. If you have had to give up running or jogging because of the impact on your joints, try trampolining instead. If you don’t have much time to exercise, trampolining could provide the answer. Research shows that 10 minutes of trampolining is the equivalent of 30 minutes running. This means that you won’t need to devote as much time to exercise to see amazing results. If you are thinking about trampolining as an exercise, consult your doctor first to ensure it is a safe activity for you to pursue. Once you have received the all clear, have fun choosing the right trampoline for your needs.